I must have walked by it a hundred times. Amidst the bustle of hard hats, spontaneous road closures and development signs, Cedric Bomford’s Substation Pavilion is a quiet attraction. Just over six feet square, the concrete structure stands plainly beside the entrance to the new Meccanica condominium on First Avenue and Quebec Street, one of the many glass towers that have sprung up around the rapidly gentrifying False Creek neighbourhood. In this community the new is re-made daily, making what little heritage we have seem like a vital commodity. I approach the odd structure warily, my small dog in tow. The panelled glass windows are frosted; the steel door does not open. With its tall ceilings and narrow profile, its dimensions are unusual for our time—curiously minimal, yet too ornate to be simply efficient. Once establishing that the building is not for entering, my dog turns her attention to an adjoining bed of ornamental plants. But what kind of restricted access is this, exactly? Mimicking the Art Deco-influenced electrical substations existing throughout Vancouver, and pointing back to earlier days of mass access to electricity, Bomford’s Substation poses as the old in the heart of the new. Its careful detailing, tiered windows and bevelled mouldings harken back to a time when ornament was paramount to visions of urban infrastructure—lowly substations and grand pavilions alike. Despite its affection for handcraft, the Art Deco movement was surprisingly economical in execution, standardizing its geometric and low-relief motifs for a variety of architectural applications. Just as design provided an opportunity to beautify one’s surroundings, it was understood that appearances were part and parcel of the urban experience: the city, a collection of visual details. But what of the invisible, subterranean systems that make it all possible? The network of substations scattered across the Lower Mainland convert high-voltage electricity into something we can use. They keep the lights on and the fridges running, so that we can drink a cool Coke on a hot day while ducking into our air-conditioned condos, away from the chaos of traffic and construction dust. Though an essential supply, our energy sources often remain hidden. Even utility boxes are deemed ‘eye sores’ and disguised with vinyl wraps of printed foliage to help us forget the mechanics of what we need to survive—and thrive—in a world of surfaces. Substation Pavilion melds into its surroundings while existing in sharp contrast to them. Dog walkers come and go; a child retrieves a soccer ball from a nearby planter. Yet the more I examine the artwork and its faux heritage stylings, the more I feel it is an imposter in this landscape. I yearn to see what’s inside, if only to confirm that it does not belong. What would I find there, a transformer, or a black hole? Such is the state of the invisible city and the secret systems that power it. I don’t know how any of it works; I just live here. The presence of the Substation Pavilion—the most utilitarian of structures; that everyday enigma, that closed door—continues to make the underbelly of the city both more apparent, and more elusive. Jacquelyn Ross is a writer and critic based in Vancouver. Based in Victoria, BC, artist Cedric Bomford’s practice explores architecture, local history and the built environment. His work often incorporates salvaged building materials and ad-hoc construction methods to realize large-scale, interactive installations. Recent projects include Deadhead (2014), a floating structure built on a barge in Vancouver’s False Creek, and The Office of Special Plans (2009), an amphitheatre constructed for the Vancouver Art Gallery’s group exhibition How Soon is Now (both in collaboration with Nathan and Jim Bomford). His ongoing research and building projects are frequently documented in his photographic practice. Bomford has exhibited nationally and internationally at venues including the Esker Foundation, Calgary, 2014; Mendel Art Gallery, Saskatoon, 2014; MOT International, London, 2013; Nanaimo Art Gallery, 2013; Dorten GmbH, Stuttgart, 2011; and Kunstlerhaus Bethanien, Berlin, 2010, among others. 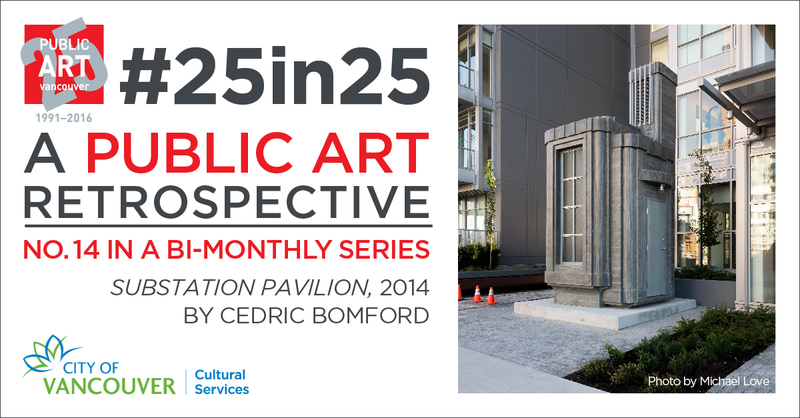 The City of Vancouver’s Public Art Program celebrates 25 years of creating extraordinary artworks for public spaces. Every two weeks during 2016 we’ll share the story of a unique artwork created through the program. Over 260 pieces have been commissioned since 1991 through civic initiatives, community grants or private sector rezoning requirements. These are only a few of the key pieces that have helped to define Vancouver as a unique place and a world-class city for public art!